After a great flight from New York, we arrived at the Fairmont Pacific Rim around 1AM. Check-in formalities were processed very quickly given the hour and the fact that we were likely the last guests to check in for the "previous night." Our keys were ready and we were on our way to the elevators and ready for bed. The Fairmont Pacific Rim was built for the 2010 Winter Olympics and is a gorgeous hotel. The lobby bar was still packed and had we not been so tired would definitely had come back down for a cocktail. Thanks to the Chase Fairmont Visa Signature Card both of our room nights were free and we had been upgraded to a giant "junior suite." I put that in quotations because there was nothing junior about this suite. Upon entering our 6th floor room, we found the bedroom on the right with a full bathroom. On the left was a second full bathroom. Straight ahead was the living room, dining area with a table and 4 chairs, and an amazing balcony with dining table and another 4 chairs. I'll let the pictures speak for themselves. We're just a couple of weeks away from our long weekend in Vancouver. This was a really easy trip to book (most weekend trips are) as there was plenty of availability for both the flights and hotels we wanted. First, I booked our flight from JFK to Vancouver in Cathay Pacific First Class. I was able to book the flight online using 65,000 British Airways Avios for both of us. There were also taxes of $44 USD. The flight is a quasi redeye leaving New York at 10PM and landing in Vancouver at 1AM PDT. Luckily, we'll have great pajamas and a bed to get some rest on the way there. As a reminder, British Airways Avios is a transfer partner of both Chase Ultimate Rewards and American Express Membership Rewards...so it is really easy to accumulate a ton of BA points. Not a bad redemption for a flight which would have cost a few thousands dollars. I am headed to a conference before our trip so I'll be making a stop for a couple of nights in Chicago prior to heading to meet Emily in New York. I paid cash for our United tickets home from Vancouver at a cost of around $400 for both of us. Yes this is a roundabout way of getting to Vancouver. But it will be a fun weekend adventure flying one of our favorite first class products. In terms of hotels, I used the free nights from my Chase Fairmont card for the first couple of nights at the Fairmont Pacific Rim. I was able to upgrade us to a suite and we'll have $100 to spend on breakfast and $50 to spend on dinner. Not bad. For the third night, I booked a paid rate ($220 USD) at the Shangri-La Vancouver through American Express Fine Hotels & Resorts. The rate includes wi-fi, breakfast, and a $100 on-property credit which we'll put to good use at the bar. All in, we booked a long weekend in Vancouver for under $700. That includes 3 nights in luxury hotels, free breakfast, $150 in dining credits, and 6 hours in Cathay Pacific First Class. Follow the blog and Instagram for updates on the journey! I'll admit I've been slacking on the blog. I hope to pick it up over the next couple of weeks as I have a bit more free time and our travel is picking up big time...so lots of trip reports to write. It's been 8 years since we were in Vancouver. It was an awesome trip and we are both pumped to be going back to celebrate my birthday. This time, we're going in style. Cathay Pacific flies a pretty awesome fifth freedom route from New York (JFK) to Vancouver. 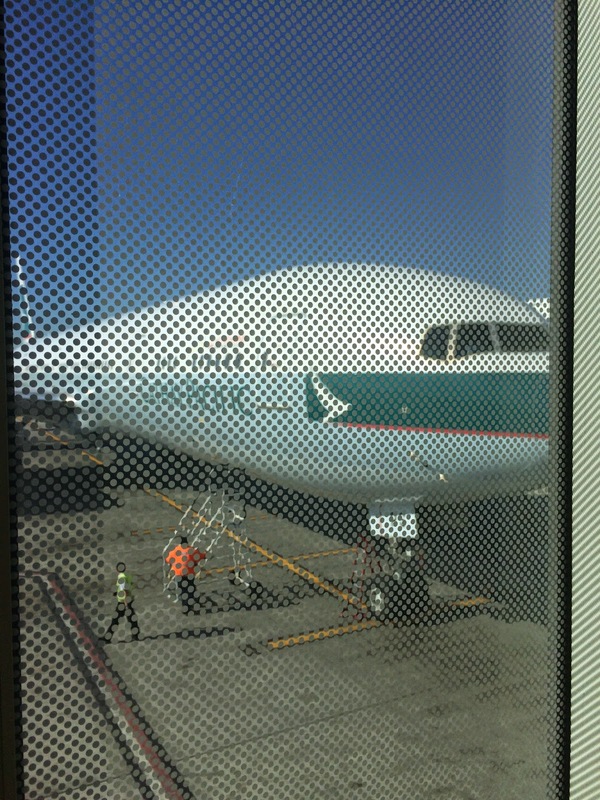 The aircraft then continues on to Hong Kong. The flight is a reverse redeye leaving New York at 10PM and getting to Vancouver around 1AM (4AM NYC time). There is typically pretty good first and business class availability on this flight. 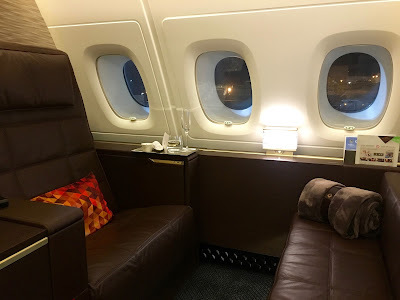 I was able to snag a couple of first class seats using British Airways Avios several months in advance. I actually have to be at a conference in Chicago the week of our trip so will meet Emily at JFK before we board the 6 hour flight to Vancouver. Yes...we are flying to Vancouver via New York. Don't judge me. We leave in early April so follow the blog for more updates around Planning & Booking and the actual trip report segments. This should be a great weekend! 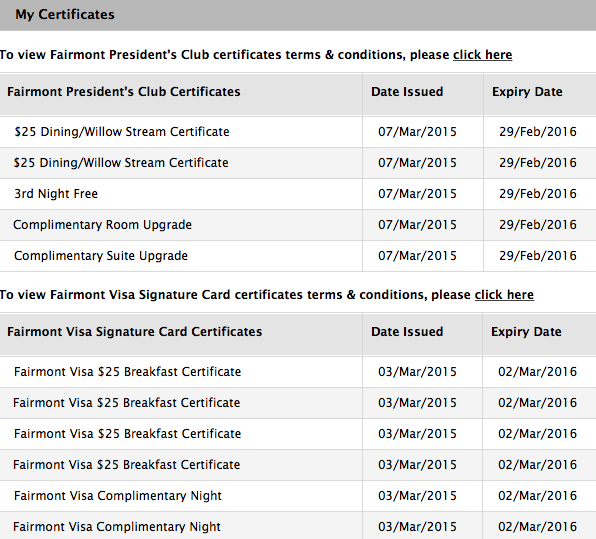 A few months ago, I picked up the Chase Fairmont Visa Signature Card. It's been a very long time since I stayed in a Fairmont property (~10 years) but I wanted to leverage the card for a couple of free nights in Vancouver. I have read that the Fairmont Pacific Rim is a phenomenal hotel and really wanted to try it out when we're there. I completed the minimum spend requirement ($3,000 in three months a couple of weeks ago. 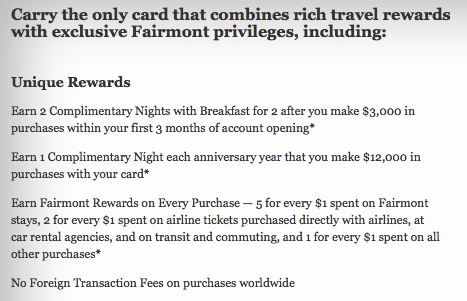 The complimentary nights posted to my account last week and I called Fairmont (the only option - they cannot be redeemed online) this weekend to redeem them. After that experience, I wanted to post about the value this card provides as it's a card that isn't written about that often. I logged in to my account to check the status of my free nights. My free night certificates had posted...with about half a dozen other surprises as part of my "upgrade" to Premier status! I figured the card was good for the free nights with breakfast. If it stopped there - that would still make it an excellent card. The breakfast coupons are actually cash vouches - four vouchers for $25 each. The upgrade to Premier status provided even more value. $50 good for dinner/lunch to be used at a Fairmont property restaurant. And a suite upgrade. Amazing. I wasn't sure if I could apply the suite upgrade to an award stay but when I called in to make my reservation, that wasn't a problem at all. We ended up in a suite retailing for over $600USD/night AI. For comparison purposes, the standard room would have been around $300/night. While we wouldn't pay the incremental $300/night for a suite, it's a great luxury to have the extra space while on vacation. Especially when there's zero out of pocket cost. There are some amazing Fairmont properties around the world. This is a great card to get you a couple of nights in a suite for basically $95. If there are two of you in your household, you could end up with four nights in a suite with $200 for breakfast and $100 for lunch/dinner for just $190 in annual fees. This wasn't a card on my radar until recently. Definitely one to have on your list especially if you're interested in Vancouver as a destination or any other Fairmont property around the world.